Made by Sydney Technical College in Sydney, New South Wales, Australia, 1923. Diploma, Electrical Engineering, awarded to Miss Florence Violet Wallace (married name Mrs F V McKenzie) on 31-12-1923, she was probably the first female to enter this field and the first to be awarded such a diploma in Australia, Australia, 1923 (OF). The diploma is signed by Lecturer in Charge Richard Simpson, Registrar A E Hibble, and Superintendent of Technical Education James Nangle. 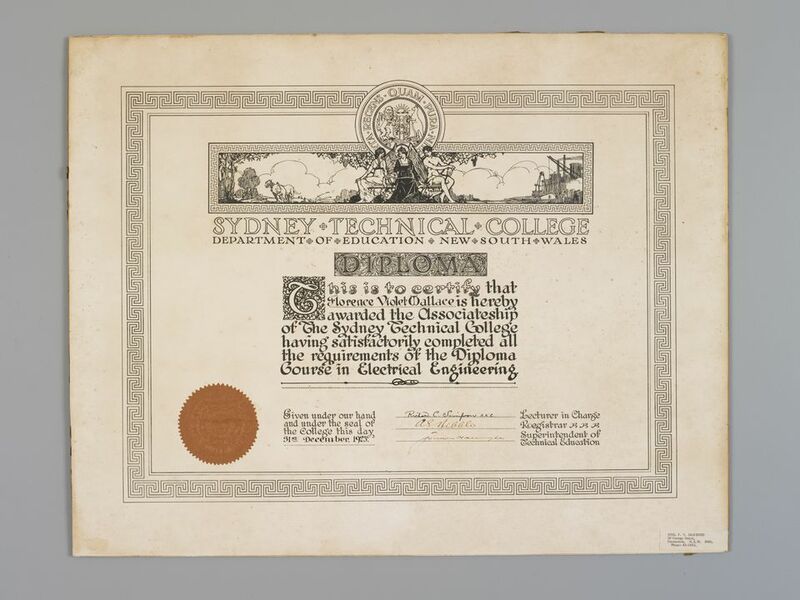 The diploma is one of many made for Sydney Technical College to issue to its graduating students. The diploma was kept by the recipient and donated to the museum in 1976. Florence Violet McKenzie was made an Officer of the Order of the British Empire (OBE) in 1950 for 'voluntary services to the Women's Emergency Signalling Corps'. Reference: The Argus, 8 June 1950.